Mission Statement: Meeting and exceeding our customers' concerns and expectations (cleaning, recycling, pest control, windows contracts, waste management, and "student first" focus) by maintaining the APPA Level II standard. This shift provides the primary custodial services. 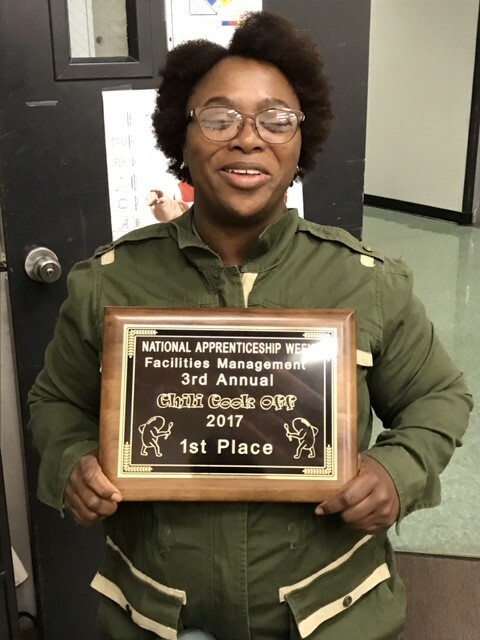 Facilities Management held its third annual National Apprenticeship Week Chili Cook Off to benefit United Way on November 17, 2017, co-sponsored by the Northwest Arkansas Plumbing School. There were a record 22 entries this year and Angela Williams (CNZB) took first place in the official taste test! RECYCLING 60 Sec from UARK Wellness on Vimeo. "Cleaning up with Coke bottles"